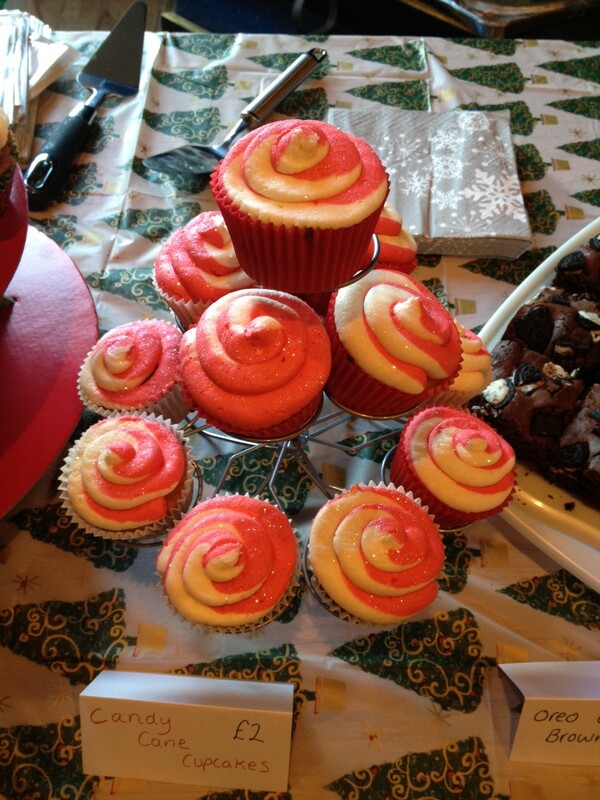 Horwich Christmas fair & Christmas Candy Cane Cupcakes! Earlier this year I got involved in a Summer Fair which had been Co-organised by my friend and Clandestine Cake Club organiser (@dollybakes www.dollybakes.co.uk) to raise money for the Bolton Neo Natal unit. So when there was talk of a Christmas Fair, I was tripping over myself to volunteer to help out again! The Horwich Christmas fair took place yesterday, and It was a fantastic event to be involved in. I think the final figure is still to be released, but I believe we raised over £1000 for such a fantastic cause! One or 2 12 hole deep muffin tins & piping bag with a medium-sized nozzle. Using a hand-held electric whisk or a freestanding electric mixer with a paddle attachment, slowly whisk together the butter, sugar, flour, baking powder and salt until the mixture resembles fine breadcrumbs. Place the milk in a jug with the vanilla essence, add the eggs and whisk together by hand. Pour three quarters of the whisked milk and eggs into the dry ingredients and mix on a low speed to combine. Increase the speed to medium and continue to mix until smooth and thick. Scrape down the sides of the bowl, add the remaining milk mixture and keep mixing on a medium speed until all the ingredients are incorporated and the batter is smooth once again. Spoon the batter into the muffin cases, filling each one up to two-thirds. If any batter is left, use it to fill up more cases in the other tin. Bake in the oven for 18-20 minutes or until well risen and springy to the touch. 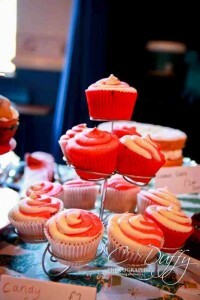 Leave to cool in the tray for a few minutes, then place on a wire rack to cool completely before you add the frosting. Using the electric whisk or the freestanding mixer with the paddle attachment, beat the icing sugar with the butter and peppermint essence on a low speed until the mixture is sandy in consistency, with no large lumps of butter left in the bowl. Gradually add the milk and slowly mix until incorporated, then increase the speed to high and whisk until light and fluffy. Divide the frosting into two, leaving one as it is and mixing the food colouring into the second batch. Lay a large segment of cling film on a flat surface and spoon one of the batches of frosting onto it creating a long log of frosting. Roll it up with the cling film, then do the same with the other batch of frosting so you have two logs of the same thickness and length. Wrap both the logs side by side with another sheet of cling film and snip off one end of the cling film and drop the log into your piping bag. 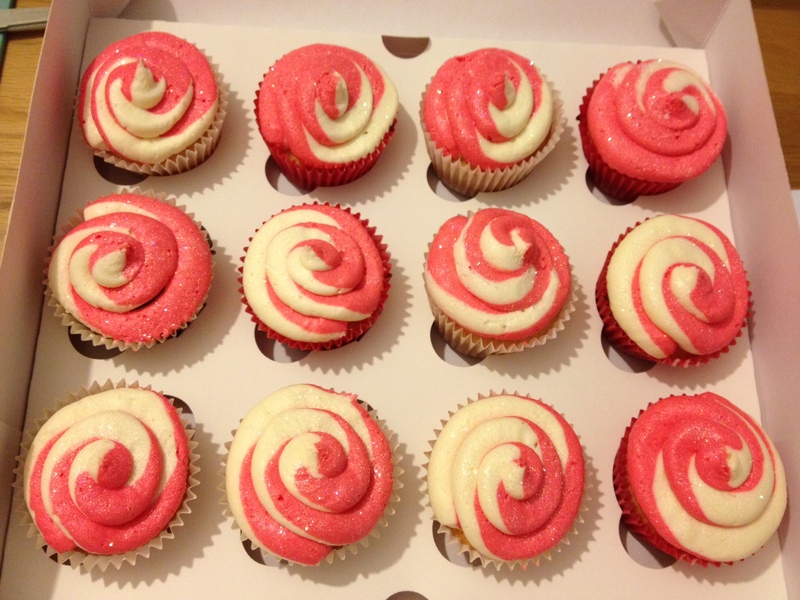 When you pipe, from the edge of the cupcake into the centre the two colours should come out side by side creating the candy cane effect. Then sprinkle with the glitter/transparent sugar. This entry was posted in Baking, Recipe by Jen. Bookmark the permalink.